Sauerkraut is one of our family’s favorite foods. This fermented cabbage-based food is a delicious condiment paired with most foods, including casseroles, stews, egg dishes, baked sweet potatoes, fish, chicken, beef, and sandwiches. Tangy, crunchy, and colorful – even our little one likes it! 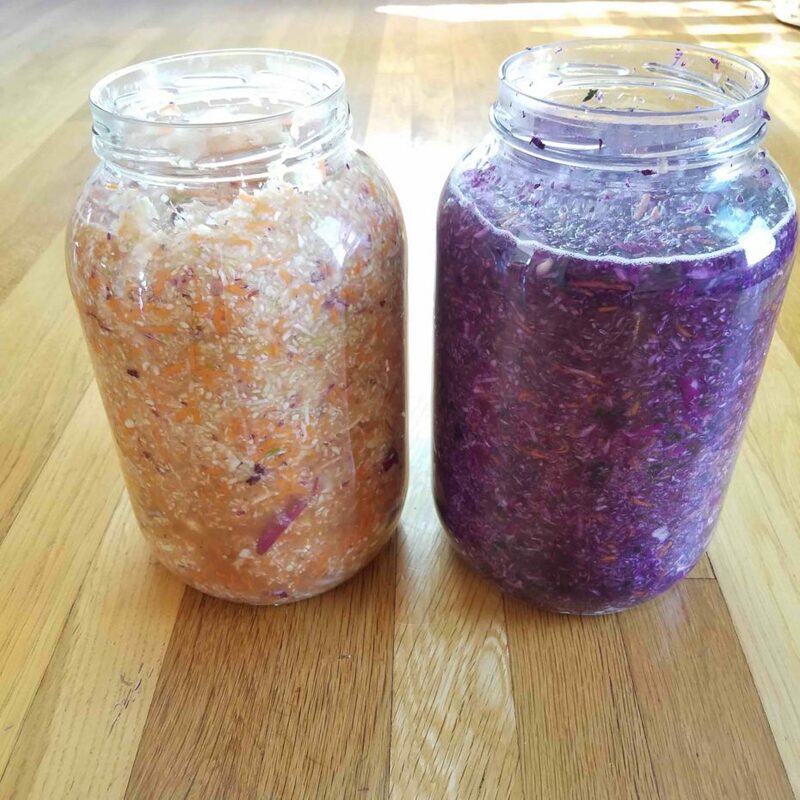 Two batches of homemade sauerkraut – one (on the left) features green cabbage, carrots, garlic, ginger, and turmeric. The other is made with red cabbage and beets. In addition to being delicious, kraut has plenty of health benefits. It’s loaded with of beneficial bacteria that build the gut microbiome and promote digestive health. Additionally, one of the main nutrients found in cabbage, sulphur, is one of the key health-promoting foods in the Wahls Protocol. According to Dr. Terry Wahls, founder of the Protocol, “Sulfur is key because it nourishes mitochondria, removes toxins from cells, and helps create proteins and connective tissue necessary for joint, skin, and blood vessel health.” Dr. Wahls recommends eating three cups of sulphur-rich foods every day – like sauerkraut! Best of all, sauerkraut is simple to make right at home. Tip: There are two basic kinds of sauerkraut – lactofermented kraut and vinegar kraut. We’re talking about the fermented kind – this is the kind that offers the health benefits we’re looking for. Your shopping list will include two ingredients: cabbage (as fresh as you can find) and ground salt (sea salt, Himalayan, Redmond’s, Kosher – all of these are perfect). Tip: To select the best cabbage, you can check three things. First, feel the weight of it. Fresh and hearty cabbage will look heavy for it’s size. The higher water content is key for the fermentation of the kraut. Select a hefty one (or two). Next, check the base of the cabbage where it was cut from the plant. Fresher cabbage will still be moist and white or light green at this cut. Finally, check the appearance of the outer leaves. Do they look dried and shriveled? Or firm and crisp? Go for the firm and crisp head. Create your own recipe with delicious additions like red cabbage, Korean chili, or ginger. Place shredded cabbage in a big metal or glass bowl. Sprinkle the salt on top of the cabbage then combine together with a pair of tongs, a big spoon or your (clean) hands. You’ll begin to hear the cabbage bubble as it weeps liquid from the contact with the salt. 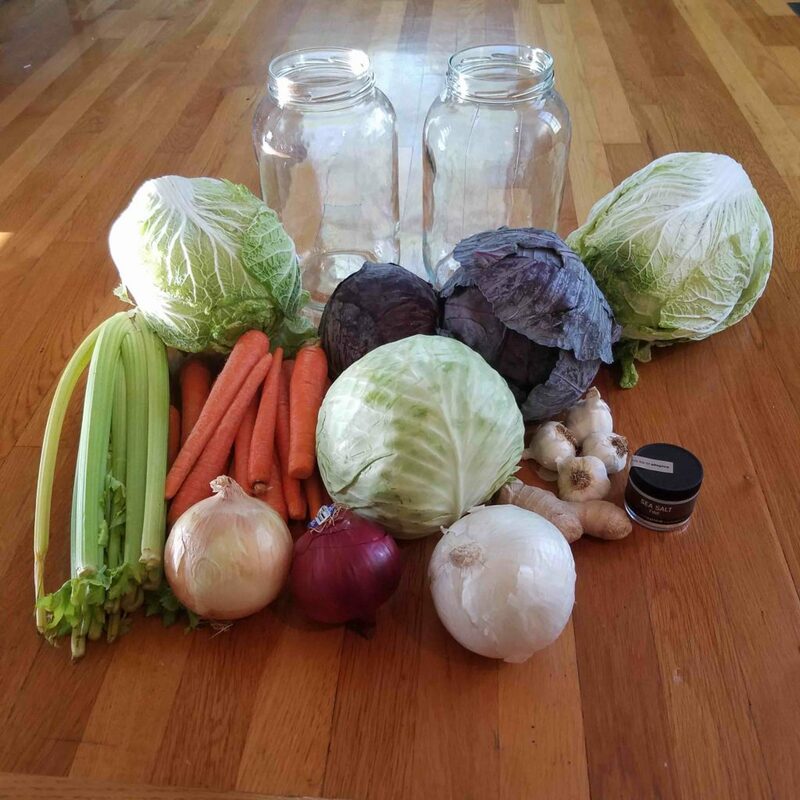 Once combined, scoop the cabbage into a big crock or glass jar and submerge the cabbage in liquid by pushing down on the top with the bottom of a jar, a small plate, or a big spoon. You’ll see air bubbles escape to the top – this is a good sign. Then, using a jar or small plate, push down the top of the cabbage so it is fully submerged in liquid. Then cover the top with a towel and place in a cool, dark spot. As the kraut ferments, it will bubble and may even overflow your container. To prevent a mess, place your jar or crock in a shallow bowl or platter to collect any excess liquid. Let ferment for two weeks or so. If you’d like it tangier, let it ferment longer. To store, place in an airtight glass container and refrigerate. Will keep for a few months. Tip: If your kraut does not produce enough liquid to cover the cabbage, you can create a simple brine with salt and water to pour on top until the cabbage is submerged in liquid. This anaerobic environment is what promotes fermentation. Create your own recipe and share your story! You can add delicious extras like turmeric, ginger, garlic, seaweed, carrots, radishes, or Korean chili. Add in these ingredients as you stir your cabbage and salt. Share your story and photos of your own batch! Post on social with the hashtag #capitalchirodsm. Most importantly, enjoy the process of creating and sharing delicious, nutritious food!